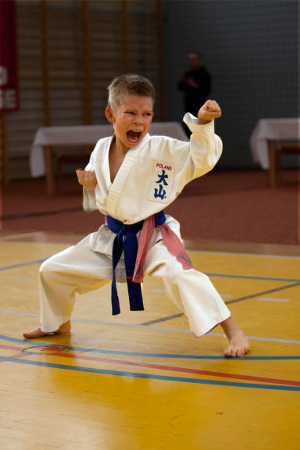 The 26th OYAMA Karate Polish Championships in Kata took place in Oświęcim. 297 competitors from 31 clubs participatated in the tournament. The competition was organized by Sensei Mariusz Pawlus 3rd dan and Sensei Tadeusz Bednarczyk 3rd dan from Oświęcimski Klub Karate (Oświęcim Karate Club). The championships were held under the patronage of local authorities and Shihan Jan Dyduch, the director of OYAMA Polish Karate Federation. 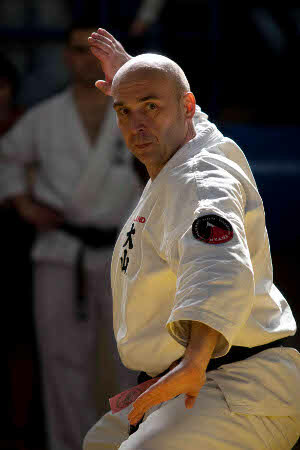 Shihan Andrzej Pierzchała 5th dan OYAMA IKF training director was also present during the competition. Sensei Paweł Pajdak 4th dan was the head referee. In the official part of the competition, Shihan Dyduch honoured the hosts with occasional,congratulatory letters and the winners of OYAMA Polish Karate Federation’2009 ranking with impressive cups of Federation. The national anthem and ceremonial marches were played by miners' orchestra from Brzeszcze Coalmine. A show group with its leader Sensei Andrzej Tomiałowicz 3rd dan from Lubsko demonstrated dynamic performance awarded with thunderous applause by numerous gathered audience. The championshops were fought off in cup system and were rated by 5 referees. 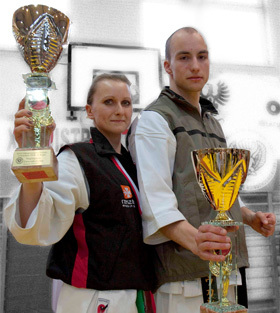 The third time in a row the best female junior of the Polish Championships became Magdalena Kraszewska, who won gold medal in both categories: Kata and Kobudo. The best seniors and the best players of the Championships became: Łukasz Światowski and Agnieszka Kaszuba, who also won gld medals in both categories. The competition were at a very good both sports and organizational level. SINCERE CONGRATULATIONS AND THANK YOU, OSU !